Welcome to the Hayward Hiking Club. 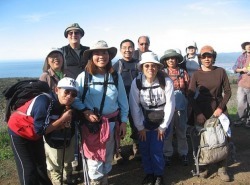 The Hayward Hiking Club invites you to try a hike with us. Have fun, get plenty of exercise, make friends, and experience nature all in one activity. 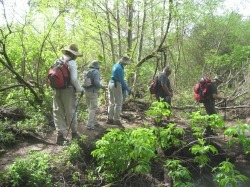 Our hikes are scheduled every Saturday and range from easy to strenuous. Each hike is different. Distances range from 5 to 12 miles. Elevation gains range from flat to 2500 feet. Hike difficulties range from easy to strenuous. The difficulty of each hike is described in our Schedule, which is published every 4 months. The hike leader's name, email, and phone number are included with the hike description so that he or she can answer any questions about the hike. Please choose a hike that fits your abilities. 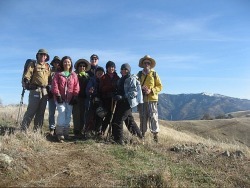 Our hikes are led by club members. Some have considerable hiking experience, some may be leading their first hike. 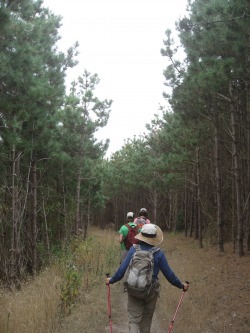 Everyone is encouraged to lead a hike on their favorite trail. 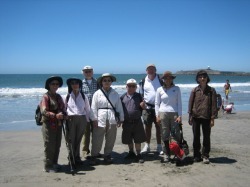 Our day hikes are on various trails throughout the San Francisco Bay Area. We range from Big Sur in the south, to Point Reyes in the north, and from Half Moon Bay in the west to Livermore in the east. 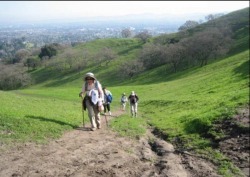 Usually the hikes are within an hour's drive of Hayward, but some may range further. We meet at one of 3 locations in Hayward, Castro Valley, or San Lorenzo and carpool from there. Passengers pay the driver an amount based on the distance driven and expenses such as parking fees and bridge tolls. Some hikes employ public transportation. Typically our activities begin at 8:30AM and end by 4:30PM. However some activities will start earlier and/or end considerably later. Membership is open to anyone over the age of 18. Minors may participate in our activities with written permission of a parent or guardian. Children under age 16 must be accompanied by a parent or guardian, and the hike leader or activity coordinator must approve their participation. The dues are a mere $10 per year per individual or family (of one address). We put together a schedule of hikes 3 times a year and distribute it via email. You are welcome to join us for free as a guest on one hike. If you would like to see a schedule, please click on Sample Schedule. Please choose a hike that is appropriate for your experience and abilities.